A crisp white look, perfect for both day and evening, the Oriaf men’s thobe is cut with tapered lines for a contemporary and sleek fit. A crisp white look, perfect for both day and evening, the Oriaf men’s thobe is cut with tapered lines for a contemporary and sleek fit. The fitted, rounded collar is finished with sharp contrast-coloured edging, coordinating with the cuff detailing and complete with a classic tassel, stylishly worn on both the outside or neatly tucked into the jubba. 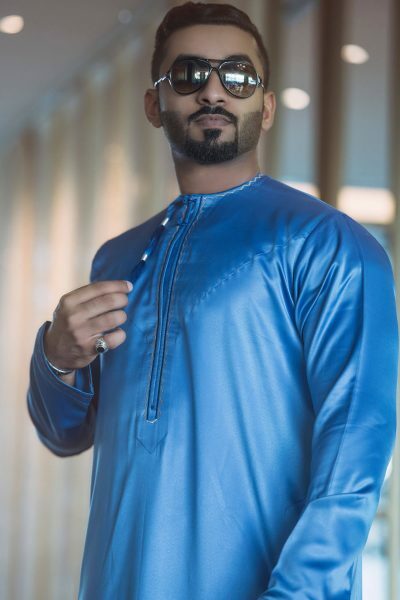 A powerful royal blue palette puts you centre stage in this striking Khalaqah men’s thobe, perfect for a more formal event. Don’t play your style safe and opt for a unique palette of icy silver and rich red with the ultra-modern men’s Thawr thobe.